Public water systems vary in the treatment of water that is delivered to the consumer, depending on whether the system uses a groundwater source or a surface-water source. Some public water systems, primarily those that utilize groundwater wells, deliver untreated water directly to the customer's tap. Groundwater is usually less susceptible to contamination than surface water, and therefore requires little or no treatment. Many large public water systems, however, draw their water from surface sources such as lakes, rivers, and streams, which are vulnerable to many types of contamination. Hence, a multiple-barrier approach to water treatment is most effective in producing drinking water that is free of health risks, meets regulatory requirements, and is palatable (acceptable in taste) to the consumer. Although groundwater generally is less likely to be contaminated than surface water, it nonetheless may require contaminant removal. Possible groundwater contaminants include naturally occurring inorganic chemicals such as arsenic, fluoride, and nitrate, as well as human-made chemicals (from solvents, fuels and pesticides, for example) that have found their way into the aquifer . Other contaminants that present aesthetic concerns are calcium and magnesium (which produce hardness); iron and manganese (which cause staining of laundry and plumbing fixtures); and hydrogen sulfide gas (which produces the unforgettable "rotten-egg" smell). The word "contaminant" includes any substance in water, including those that are not harmful, even though popular usage often refers only to harmful pollutants. Hard water is usually treated with the water "softening" method, which utilizes a resin-coated media that exchanges its ion (usually sodium) for the calcium and magnesium ions that are responsible for hardness. The watersoftening media must be regenerated periodically with a brine (very salty) solution. 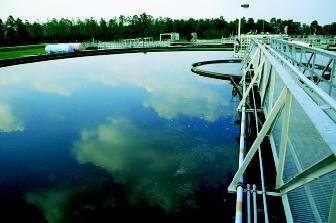 Settling tanks at a water treatment plant allow coagulated particles to settle to the bottom of the tank. The settled material is periodically drained and collected for eventual disposal in a landfill. or potassium permanganate. The oxidized metals can then be filtered out as the water passes through a sand media. A zeolite sand, commonly known as manganese greensand, is usually used for this filtration. Some groundwaters have taste and odor problems that require treatment in order for the water to be palatable to the user. Chlorine and ozone are effective in reducing hydrogen sulfide odors, and simple aeration can rid the water of some volatile organic compounds , such as solvents or petroleum byproducts. Many large cities are served by surface-water sources; most of these surface waters are exposed to a variety of contaminants. Common contaminant sources are untreated sewage and runoff from fertilized fields, parking lots, or unprotected watersheds. The primary contaminants of concern are microbes, including Giardia and Cryptosporidium. Effective surface water treatment therefore relies on the multiple-barrier approach, involving a sequence of processes from among the following options. Simple screens over intake pipes in lakes or rivers can prevent large debris, such as leaves, sticks, or small fish from entering the treatment plant. Waters that exhibit seasonal changes in turbidity or algae growth may require an oxidant such as chlorine, potassium permanganate, or ozone for pre-treatment. Chemical Feed and Rapid Mix. Coagulants such as alum, ferric chloride, or synthetic polymers are added to the raw water and mixed rapidly. Chemicals to adjust the pH may also be added at this point. The effectiveness of further treatment depends partly on raw water chemical characteristics such as pH, temperature, and alkalinity. Small filters made of pleated paper, carbon, or synthetic resins often are used by consumers. Pleated paper filters can remove sand, dirt, and some iron. Carbon filters are effective against chlorine and organic chemicals such as herbicides and pesticides, and can also remove objectionable tastes and odors. Some manufacturers of resin-type filters claim a high removal of lead or other inorganic chemicals. particles that can then be settled or filtered. This process is known as flocculation. The sedimentation process then allows the larger "floc" particles to settle in a basin. The cleaner water at the top of the sedimentation basin flows onto the filter. The filter media is usually a mixture of carefully graded and specified gravels and sands, specifically designed for particle retention. These removed particles include turbidity and biological contaminants such as Giardia and Cryptosporidium. Inorganic chemicals such as arsenic and mercury are also removed by proper coagulation and filtration. This process is designed to kill disease-causing microorganisms such as bacteria, viruses, and protozoa. Chlorine is most commonly used for this purpose, although ozone and ultraviolet light are increasingly being used in public water systems. The single-celled protozoa ( Giardia and Cryptosporidium ), which can cause severe intestinal illness, are more resistant to traditional disinfectants than bacteria or viruses, and the disinfection process must therefore be closely monitored. A number of other treatment technologies are employed both by the public and private sector, depending on the needs and desires of the water users. Granular-activated carbon is used for the elimination of objectionable tastes and odors, as well as for removal of organic chemicals such as pesticides and herbicides. Sodium carbonate, commonly known as soda ash, can be used to raise the pH of the water to make it less corrosive to pipes and plumbing fixtures. Some public water systems add small amounts of fluoride in order to aid in the prevention of dental cavities in children. In addition, many small water treatment units, designed to fit under the kitchen sink or in any other convenient location, are used by individual homeowners regardless of the water source. Cartridge filters, membrane filters, and reverse osmosis units are all able to filter out most contaminants that cause health risks and aesthetic concerns. Water softeners are often necessary to treat hard water. Small ozone or ultraviolet-light disinfection units are becoming popular with homeowners who depend on private water supplies of questionable quality. 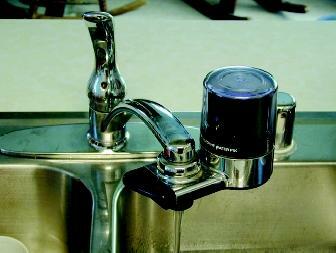 Many different types of water treatment units are designed for the individual homeowner. When considering the purchase of such a unit, the homeowner should have the water tested to determine exactly what type of contaminants are in the water, and what, if anything, needs to be removed. No one filter works for all contaminants. A filter that removes iron and manganese, for example, will probably not remove herbicides or pesticides. It is also important to remember that all treatment units require regular maintenance to keep them functioning properly and to prevent the buildup and possible breakthrough of the unwanted contaminants. SEE ALSO Fresh Water, Natural Composition of ; Fresh Water, Natural Contaminants in ; Pollution of Groundwater ; Pollution of Lakes and Streams ; Safe Drinking Water Act ; Supplies, Public and Domestic Water . Peavy, Howard S., and Donald R. Rowe. Environmental Engineering. New York:McGraw-Hill, 1985. Viessman Jr., Warren, and Mark J. Hammer. Water Supply and Pollution Control. NewYork: Harper & Row, 1985. I need information and recommendations,to the effect that my water system. The turbidity of the water is refusing to go the mark of 1 NTU, we just removed mud a hard sludge which resulted from poor disludging. Now the other problem is that after wards the turbidity just dropped to around 2NTU and no better? Lastly is that these days in the morning the soda solution freezes, as a result in the morning hours the floc die down till around noon that u start seeing floc again? What are the posible causes? i have a question and it is: what is the main different between ( SWTP ) and ( wwtp ) ?? and the second question is: can we found any amount of ( BOD or COD ) in the "SWTP"